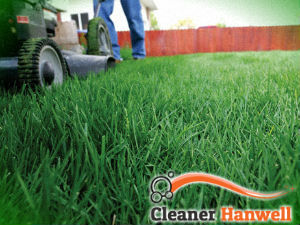 The grass cutting services we provide across Hanwell will transform your lawn into the best looking one on the street. We are dedicated to our customers and aim at meeting their high expectations in terms of quality, affordability and flexibility. As a leading gardening contractor, we have invested in the latest professional mowers which allow us to mow your lawn to perfection, lending it a neater, denser and greener look after a few visits only. Contact us over the phone to request a free estimate of your green areas and specify your requirements! After fifteen years in this trade, we have the experience, expertise and motivation to cut your grass to perfection. Always honest with our customers, we begin with a free evaluation of their lawns’ condition which helps us determine the right course of action and draw the price in advance, so that there are no hassles when the time to pay draws near. The height your grass needs to be reduced to largely depends on the season. Once our amiable and experienced gardeners have cut your grass, they will proceed by carefully trimming the edges of the lawn and your driveway to lend an even tidier appearance to your green areas. All clippings will be disposed of and the team will finish off by spraying with specialised repellents to keep weeds and insects at bay. Regular maintenance plays an essential role in taking proper care of your lush lawn. 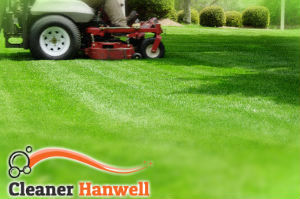 We suggest you book our grass cutting services in Hanwell for weekly, biweekly or monthly sessions to keep your lawn at its best. Don’t hesitate to give us a call anytime – we are always there for our customers!